for a "Show and Tell". we always put the kettle on. and the lovely blues picked up the blue in the transfer ware. 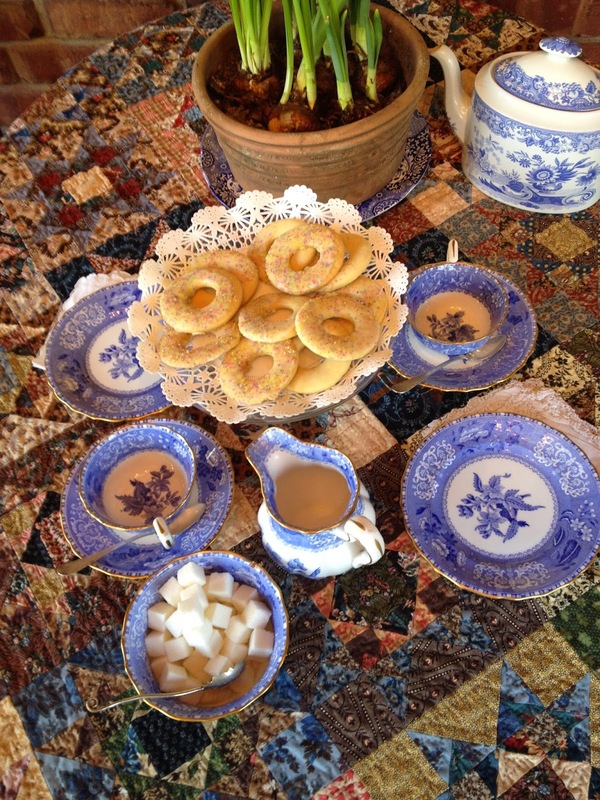 and they were the perfect nosh with afternoon tea. And a friend to share them with! Life isn't any better than that! Besides the Random Access quilt, Nancy also brought two others. Based on the tiles she saw on a trip to Italy. What a wonderful remembrance of a trip! We visited, talked quilts and quilting, nibbled and sipped. Soon the afternoon was gone and we bid goodbye! It's Tuesday and I'm sharing my tea with Sandi at Rose Chintz Cottage for Tea Time Tuesday and with Marty at A Stroll Through Life for Inspire Me Tuesday. The Downton quilt is beautiful. I got some of the fabric to make a scarf. The Lady Edith collection. I'm using one of my quilts in my post today, but you can't see much of it. I'm planning on showing more of it in a future post. Have a great week. Your cookies look inviting...cookies are my downfall ..
Beautiful quilts and yes, wonderful as a table cloth! Those quilts really are lovely, Martha, and I love the one on the tea table. Those wreath cookies are pretty and would be tasty with tea. If I remember, I might tackle them myself for the Easter holidays. I could probably use my sugar cookie recipe. Thank you for sharing and joining me for tea. Pretty quilts and the Easter wreath cookies are sweet. You have only been having cookies with tea on Sundays, did you switch up the day last week? Our 10 year old granddaughter gave up pumpkin pie for Lent - such an opportunist. Beautiful quilts!! Nancy was right, they make a wonderful background, I love the muted tones of the first one. 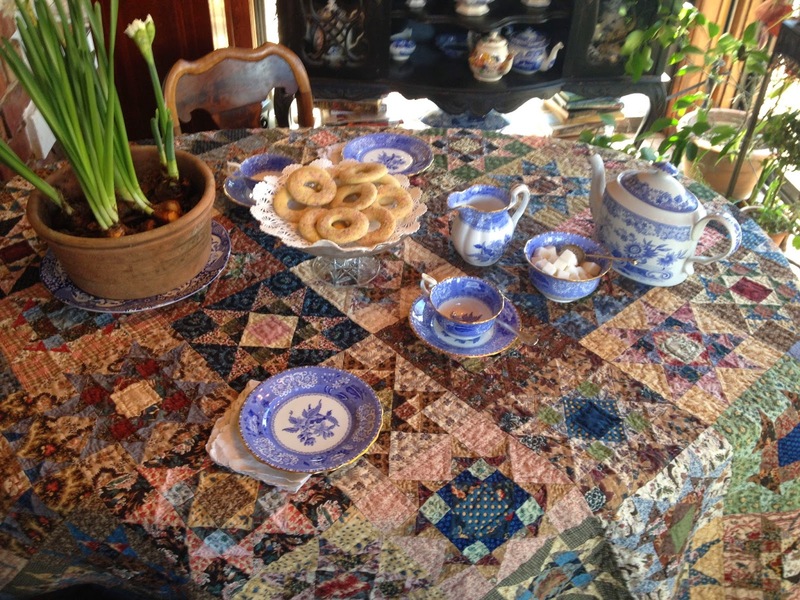 Nancy's quilt shows beautifully with your Blue & White for tea, dear friend!!! 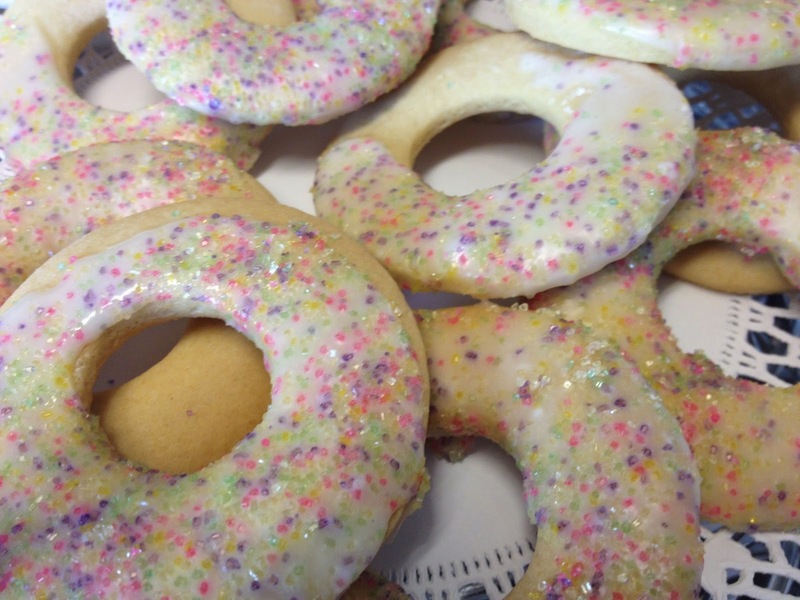 Those Italian Wreath Cookies look divinely delicious!! As a quilter myself I really enjoyed seeing all the quilts. So cozy and charming! I have never used a quilt on my table, but LOVE the idea. 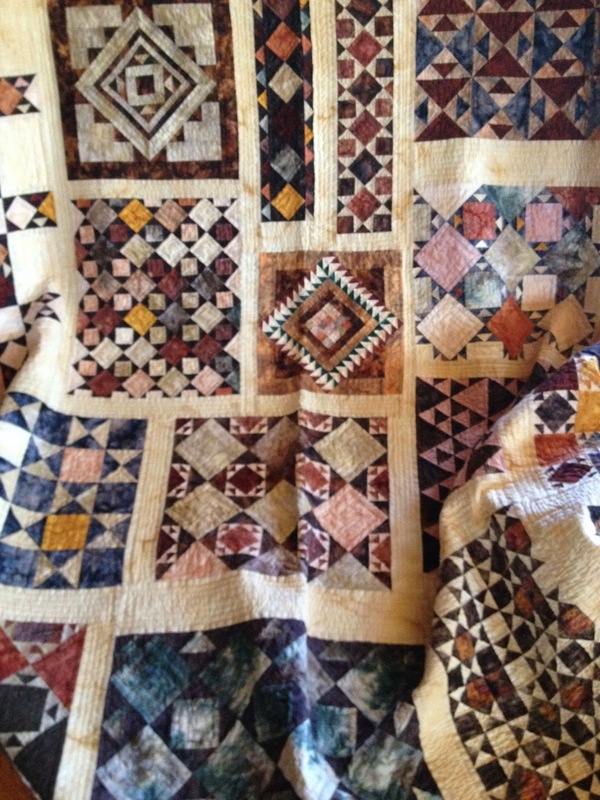 The quilts are just lovely pieces of art. Your table is so inviting and those cookies look yummy. Have you ever read the fun series of books called The Elm Creek Quilts? It is a series of historical fiction about a "quilt camp" and they weave quilts and their history into the stories. Thought you may enjoy them. The quilts are beautiful that you friend made, Martha. The one is such a pretty backdrop for your blue dishes. Yes, tea, a cookie and sharing with a friend doesn't get much better!